Serving the communities of Thorp Arch and Walton for over 30 years, Causeway is delivered free every month to almost 500 homes. 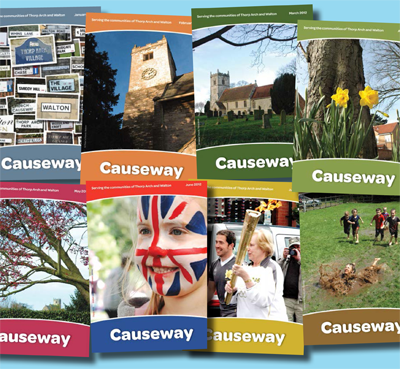 A blend of village news, local events, church information and reviews, Causeway is a well-received community magazine valued equally by readers and advertisers alike. Causeway is designed, edited and delivered by a team of volunteers - each household in Thorp Arch and Walton receives it free of charge. Editorial is always welcome. We have 10 issues a year (leaving out August and January) and editorial contributions can be sent (by 14th for following month's edition) to causeway.editor@gmail.com for consideration. We will always try to include local news and upcoming events. Please send your advertising enquiries to John Clayton.